Sylheti or Syloti (সিলেটী Sileṭi or ছিলটী Silôṭi) is an Eastern Indo-Aryan language, primarily spoken in the Sylhet Division of Bangladesh and the Barak Valley region of southern Assam, India. 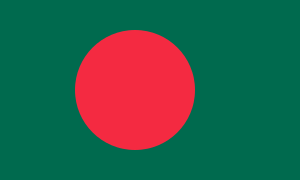 This language is considered a dialect of the Bengali language by the government of Bangladesh. Though there is an incomplete mutual intelligibility, it shares a high proportion of vocabulary with Standard Bengali: Chalmers (1996) reports at least 80% overlap. Sylheti is the common English spelling of the language name after the accepted British spelling of the Sylhet District, while the usual transliteration of the Standard Bengali spelling of the name is Silheti. In ancient literature, Sylhet was referred as Shilahat and Shilahatta. In the 19th century, the British tea-planters in the area referred to the vernacular spoken in Surma and Barak Valleys as Sylheti language. In Assam, the language is still referred to as Sylheti. During the British colonial period, a Sylheti student by the name of Munshi Abdul Karim studying in London, United Kingdom, after completing his education, spent several years in London and learnt the printing trade. After returning home, he designed a woodblock type for Sylhetinagari and founded the Islamia Press in Sylhet Town in about 1870. Other Sylheti presses were established in Sunamganj, Shillong and Kolkata. These presses fell out of use during the early 1970s. Since then the Sylotinagri alphabet has been used mainly by linguists and academics. It gradually became very unpopular. The script includes 5 independent vowels, 5 dependent vowels attached to a consonant letter and 27 consonants. The Sylheti abugida differs from the Bengali alphabet as it is a form of Kaithi, a script that belongs to the main group of North Indian scripts of Bihar. The writing system's main use was to record religious poetry, described as a rich language and easy to learn. Campaigns started to rise in London during the mid-1970s to mid-1980s to recognise Sylheti as a language on its own right. During the mid-1970s, when the first mother-tongue classes were established for Bangladeshis by community activists, the classes were given in standard Bengali rather than the Sylheti dialect which triggered the campaign. During the 1980s, a recognition campaign for Sylheti took place in the area of Spitalfields, East End of London. One of the main organisations was the Bangladeshis' Educational Needs in Tower Hamlets (usually known by its acronym as BENTH). However this organisation collapsed in 1985 and with its demise the pro-Sylheti campaign in the borough lost impetus. Nonetheless, Sylheti remains very widespread as a domestic language in working class Sylheti households in the United Kingdom. Middle-class Sylheti families are adopting standard Bengali as their 'home' language. In Pali মেঘ megh means both rain and cloud. In Sylheti cloud is called বাদল badol, সাজ haz or আসমানী সাজ ashmani haz (decor of the sky). In Standard Bengali বৃষ্টি brishti means Rain. In Sylheti, blanket is called রাজাই razai. In Sylheti, *কম্বল khombol means buttocks. Transliteration Shab mānush svādhīnbhābe janma hai izzat ār adhikār laiā. Tārār hush ār ākl-buddhi āche ār tārā ekjan ārakhjanar lage rūhāni bhāittā bebahār tākta. Transliteration Shab manush sbadhinbhabe sôman môrzada ebông ôdhikar niye jônmôgrôhôn kôre. Tãder bibek ebông buddhi achhe; sutôrang sôkôleri êke ôpôrer prôti bhratritbôsulôbh mônobhab niye achôrôn kôra uchit. All people freely born is dignity and rights with. Their conscious and intelligence have and they someone another one with spirit brotherhood demeanor must have. All human free-manner-in equal dignity and right taken birth-take do. Their reason and intelligence exist; therefore everyone-indeed one another's towards brotherhood-ly attitude taken conduct do should. Sylheti is distinguished by a wide range of fricative consonants corresponding to aspirated consonants in closely related languages and dialects such as Bengali; a lack of the breathy voiced stops; word-final stress; and a relatively large set of loanwords from Arabic, Persian and Assamese. Sylheti has affected the course of Standard Bengali in the rest of the state. A notable characteristic of spoken Sylheti is the correspondence of the /ʜ/ (from hereby transliterated as x), pronounced as an Voiceless epiglottal fricative to the [ʃ], or "sh", of Bengali, e.g. Apnar nam ki? Afnar nam kita? Afnar nam Kita? What's your name? Bhalo Achhen? Bala acoen ni? Bala asoin ni? How are you? Shilchor kon dike pore? Xilcor xun baidi phorce? Hilsor khun baidi forse? Which way to Silchar? Shōwchagar kōthay? Xocailoe ba leftin xun xano? Hosailoe ba liftin khun khano? Where is the toilet? Eiṭa ki? Oxṭa xita? Okhṭa kita? What is this? Oṭa ki? Outa xita? Outa kita? What is that? ↑ Hammarström, Harald; Forkel, Robert; Haspelmath, Martin; Bank, Sebastian, eds. (2016). "Sylheti". Glottolog 2.7. Jena: Max Planck Institute for the Science of Human History. ↑ Grierson, George A. (1903). Linguistic Survey of India. Volume V, Part 1, Indo-Aryan family. Eastern group. Specimens of the Bengali and Assamese languages. Calcutta: Office of the Superintendent of Government Printing, India. Wikivoyage has a travel guide for Sylheti phrasebook.